If you think maintaining an accurate record of who’s who across one facility is difficult, try doing it across multiple organizations. With the Affordable Care Act granting more Americans access to health care, the demand for better patient identity technologies continues to climb. The combination of additional patients and the growth of data-sharing health information exchanges (HIEs) may lead to serious patient identification problems, including duplicate records, overlays, and other inaccuracies. Hospitals with lax processes or that fail to employ strong patient-matching algorithms can potentially tarnish data flowing through HIEs. Bad data easily can spread as information travels across different facilities and organizations. Michele D’Ambrosio, MBA, RHIA, director of health information for New Jersey-based Inspira Health Network, says once an inaccuracy is detected, it can be difficult to deconstruct the record to determine who is who. “One person may have been treated for one issue, then the other party comes in for something else. They are now comingled on one record. The problem then becomes very complex with many layers to it,” she says. Because HIEs and data repositories access data electronically, if facilities are unaware that two records are comingled or duplicated, the error easily replicates throughout the system. In the past, back offices manually corrected problems stemming from faulty registration and scheduling. However, today’s facilities rely more on technology to complete these tasks. While HIT makes the process more efficient, human error continues to be a large part of the problem. Consequently, HIM professionals are working to raise awareness among the caregiver community, payers, and patients themselves to ensure that accurate information is provided from the beginning of the health care process. Many issues, including incorrect formatting within data fields, data entry errors, smaller organizations’ inability to afford patient matching capabilities, and patient engagement efforts that have not yet sufficiently evolved, create stumbling blocks to acceptable patient identification rates. Even organizations comfortable with their data accuracy must be cognizant that patient information is sometimes beyond their control. 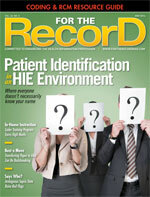 “Once [patient identities] are cleaned up, who stores the data? That’s hundreds of thousands of dollars that a hospital can be spending to ensure the information is accurate, but what happens to it after it flows through the HIE?” Gash notes. Standardizing key data fields that are used in patient matching can help ensure that patients are correctly identified and records remain accurate. “But for errors that occur in registration and scheduling, a standardized EMR will not be effective unless the software has scheduling and registration modules as part of its suite,” Just says. In February, the ONC released the Patient Identification and Matching Final Report, part of an effort to better manage data governance and create policies for measuring data quality. The report centers on how best to maintain accurate patient identification across disparate health care systems whose goal is to share patient information. The study suggests that standardized patient identification attributes become mandatory, data changes be coordinated across relevant organizations, and EMR technology be certified to uniformly capture patient data. Furthermore, the report calls for the HIM industry to develop best practices to encourage consumers to provide accurate information, disseminate those best practices and policies through detailed training materials, and continue to collaborate with federal agencies to ensure the accuracy of patient information.